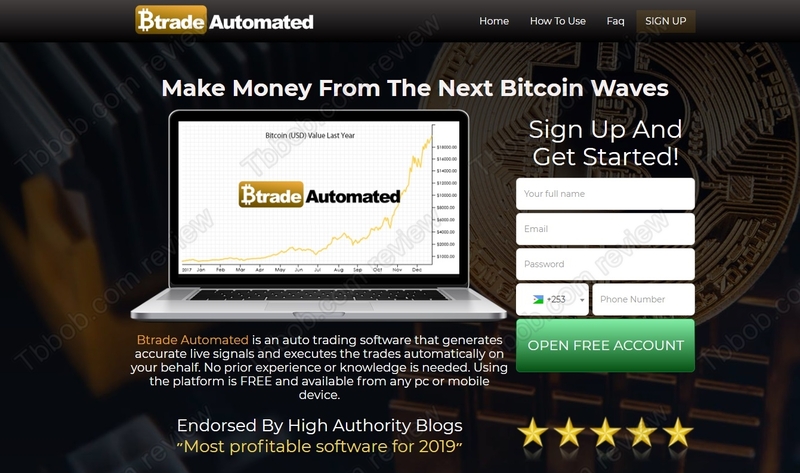 Btrade Automated is presented as an auto trading software that generates profitable signals for bitcoin and executes them on your behalf. In other words a profitable bitcoin robot. It costs nothing, so do you have anything to lose? The reality is that Btrade Automated is an automated scam made to lose your money with a shady broker. Right on the top of Btrade Automated’s web page you can see a chart that says the value of bitcoin went up last year. But the opposite is true, bitcoin went down in 2018, look at our picture to see the reality. Btrade Automated tries to convince you that it is profitable by showing you some testimonials of alleged customers. But they are fake. As you can see, they used stock photos, these reviews are not real. Btrade Automated is a typical scam. It is a losing software that has only one purpose: to make you deposit with an affiliated and non-regulated broker. This combination will make you lose money quickly, before you realize what is going on. Btrade Automated is a scam, it wants to lose your money with a crappy software and shady broker, stay away from it! If you want to try crypto trading, do it on a free demo with a regulated broker. You have to learn to trade profitably before eventually investing real money. For real trading use only money you can afford to lose, this is the first rule of trading.